Station Hollywood: Happy birthday to Fardeen Khan. Happy birthday to Fardeen Khan. Happy birthday to Fardeen Khan. The viewers of bollywood films wish happy birthday to Fardeen Khan on 8th March, 2018. He had created an identity for himself inspite of being the son of popular bollywood star Feroz Khan. Most of the sons and daughters of the celebrities of bollywood films had always struggled due to comparison of them with their parents. In case of Fardeen Khan, he never tried to imitate Feroz Khan. Feroz Khan was famous for his stylish performance in action films including Oonche Log, Apradh, Dharmatma, Khote Sikke, Qurbani, Jaanbaaz, Yalgaar, etc. In most of these films he introduced Hollywood style of acting in Indian films. 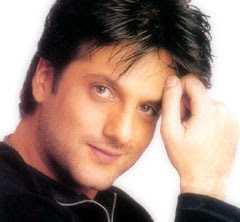 Fardeen Khan instead of imitating his father created a simple style of acting which suited different types of films. His performance in the film No Entry in 2005, requires special mention. He played the character of a journalist in the film in the company of Anil Kapoor. He had an affair with Celina Jaitley, but just because he had to save Anil Kapoor, he told a lie to Lara Dutta that Bipasha Basu was his wife. From that time onwards he just went on telling one lie after the other. He went to Mauritious for honeymoon. Even there he found Anil Kapoor and Lara Dutta and his relationship with Bipasha Basu was revealed. Both Lara Dutta and Celina Jaitley filed divorce suits against Anil Kapoor and Fardeen Khan respectively due to their relationship with Bipasha Basu. Salman Khan had to come all the way from abroad to save the situation. His playacting with Esha Deol had helped both Fardeen Khan and Anil Kapoor to ease out their relationship with their wives. Fardeen Khan’s lips in the song “kahan ho tum” was very impressive. The film had excellent songs and the comedy sequences appealed to the viewers. The film ended up being a blockbuster. The other notable films of Fardeen Khan included Bhoot with Urmila Matondkar, Jungle with Urmila Matondkar, etc. In Bhoot he played a negative character but expressed the horror feelings to perfection when Urmila Matondkar’s spirits haunted him. The film Jungle was based on the story of Veerappan in the forests of Karnataka where he became a smuggling don. Fardeen Khan’s performance in the film Dev was also worth mentioning. In 2009, Fardeen Khan’s film All The Best with Sanjay Dutt and Ajay Devgan did business worth 60 crore rupees. He played the role of the brother of Sanjay Dutt who used the pocket money to do weird acts. His friend Ajay Devgan used to give him ideas but it created more trouble for Fardeen Khan. When Sanjay Dutt came for sudden visit to his house as his flight got delayed, the chaos and confusion entertained the viewers. Fardeen Khan’s docile image in the film balanced the aggressive image of Sanjay Dutt. Bipasha Basu and Mugdha Godse complimented the stars in the film. It is difficult for Fardeen Khan to match the popularity of Salmaan Khan or Shahrukh Khan or Hrithik Roshan in the present time. But even with his limited popularity he has created an identity with which he can be categorized. In 2016, his film No Entry Mein Entry will be completed. He will act with the same team that he acted in No Entry, including Salman Khan and Anil Kapoor. The viewers expect Fardeen Khan to explore himself further in bollywood films in future. Rafisahab and OP Nayyar had fabulous combination. Happy birthday to Kangana Ranaut. Death of actress Sri Devi shocked the nation. Happy birthday to Akshay Khanna. Happy birth anniversary to Shashi Kapoor. Happy birthday to Anupam Kher. Happy birthday to Bobby Deol.